We facilitate an industry that ensures transport services, (taxis and hire cars, including rideshare) are accessible for all members of the community, including people with a disability. This page provides information on accessible commercial passenger vehicle services across the state. Wheelchair Accessible Vehicles (WAVs) allow people who use wheelchairs to travel in their wheelchair if they and the wheelchair can be safely restrained in the vehicle. WAVs are vehicles designed or modified to carry one or more people seated in wheelchairs (depending upon the vehicle type) and between 4 and 11 passengers when not configured to carry wheelchairs. Scooters, Princess, and other 'high-care' chairs must not be transported in wheelchair accessible taxis if the passenger is seated in them, as it is not safe. the passenger can move into a fixed seat in the vehicle and use the seat belt. WAVs are required to give priority to bookings by people who use wheelchairs but may be used to carry other passengers when not engaged with wheelchair bookings. When not carrying wheelchair passengers, WAVs have the same operating rights and conditions as standard commercial passenger vehicles, but charge a higher high occupancy fee (metropolitan) and higher occupancy fare (Geelong, Ballarat, Bendigo, Country and Regional) when carrying five or more passengers. WAVs are available in Melbourne and regional areas. Ask your Booking Service Provider for a WAV when you book. The Multi Purpose Taxi Program (MPTP) is available to assist with the travel needs of people with severe and permanent disabilities by offering discounted taxi fares to members of the program. Our aim is to introduce more transport options for MPTP passengers, so that soon you can choose to take a taxi or hire car, including rideshare service. 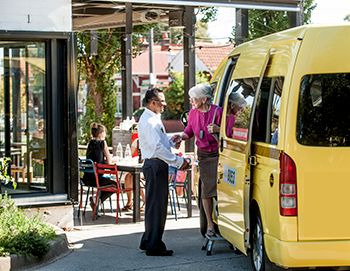 Commercial Passenger Vehicles Victoria is currently partnering with both taxi and hire car (including rideshare) Booking Service Providers to trial technology that may enable them to carry MPTP passengers, subject to strict controls. We are working with industry to ensure their technology is compatible with ours, that they can offer you a safe service and that your entitlements don’t change (you receive the full subsidy and don’t not have to pay a lifting fee). We will notify our MPTP members the results of the trial, and any new transport options available to them at the conclusion and evaluation of all trials. Assistance animals, such as guide dogs must be accepted by the driver for carriage within the vehicles. You can find more information about your rights when travelling with an assistance by visiting the Carrying asistance animals page.